A “Performage” Deck that uses “Day-Breaker the Shining Magical Warrior” from “Structure Deck R: Lord of Magician”. Link Summon “Day-Breaker the Shining Magical Warrior”, then use the effect of the “Performage Trick Clown” sent to the GY as a Link Material Special Summons itself to the Link of “Day-Breaker the Shining Magical Warrior”, placing a total of 2 Spell Counters. Also, “Dwimmered Path” can recover “Performage Hat Tricker” (which can Special Summon itself) or “Effect Veiler” (which can disrupt the opponent”) from the GY to your hand. A Deck that makes use of “Rogue of Endymion” from the May 2019 Issue of V Jump. The effect of “Convulsion of Nature” allows you to see the top card of your Deck. The 2nd effect of “Rogue of Endymion” lets you Set either “Convulsion of Nature” or “Archfiend’s Oath” from your Deck. Use the effects of “Archfiend’s Oath” and “SPYGAL Misty” to increase the size of your hand, and then use the effect of “The True Name” to Special Summon “Slifer the Sky Dragon”. Since the Special Summoned “Slifer the Sky Dragon” is sent to the GY during the End Phase, before that, banish it with the 2nd effect of “Timebreaker Magician”, allowing you to return it to the field during your next Standby Phase. A Deck combining “Fire Fist” and “Crusadia” using “Rogue of Endymion” from the May 2019 Issue of V Jump. In a good tandem with “Fire Fist”, use the 2nd effect of “Rogue of Endymion” to grab powerful “Fire Fist” Continuous Spells. Recover the “Crusadia Reclusia” you need for the cost to activate the 2nd effect of “Rogue of Endymion”, with the effects of cards like “Guidance of Spell Salvation” and “Brotherhood of the Fire Fist – Lion Emperor”. An “Aroma” Deck that uses “Performapal Kuribohrder” and “Rose Bell of Revelation” from “Premium Pack 2019”. “Performapal Kuribohrder”, which has an effect to make you gain LP, works well with an “Aroma” Deck. 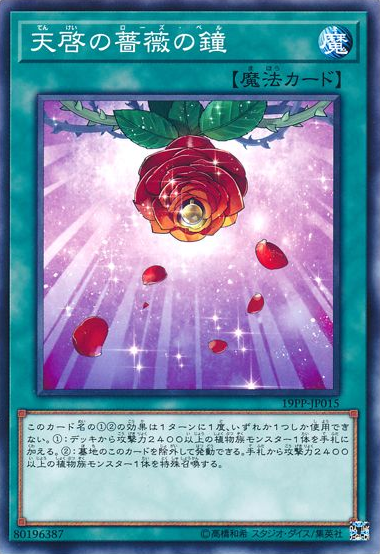 The 2nd effect of “Rose Bell of Revelation” lets you Special Summon “Gigaplant” and “Aromage Bergamot” from your hand, allowing you to Xyz Summon “Constellar Ptolemy M7”. With the effect of “Constellar Ptolemy M7”, you can recover cards from the GY to the hand that let you gain LP, such as “Performapal Kuribohrder”, “Null Nun & Blooming Dogwood” and “Aromaseraphy Angelica”, allowing you to activate the effect of “Dried Winds”. A “Mokey Mokey” Deck that makes use of “Bye Bye Damage” from “Premium Pack 2019”. Raise the ATK of “Mokey Mokey” with “Mokey Mokey Smackdown”. The effect of “Mokey Mokey Smackdown” applies until the end of turn, means the ATK of “Mokey Mokey” returns to normal, so during damage calculation, when “Mokey Mokey” is attacked, you can activate “Bye Bye Damage”, dealing effect damage to your opponent. And, during the turn “Action Spell – Full Turn” is activated, you can deal massive damage to your opponent. In order to assemble the vital cards for your Deck, use the effects of “Battle Fader” and “Ankh Kuriboh”, while also Special Summoning “Mokey Mokey” from the Deck with the effects of “Treasure Panda” and “The League of Uniform Nomenclature”. A “Sylvan” Deck with “Rose Bell of Revelation” from Premium Pack 2019. The first effect of “Rose Bell of Revelation” allows you to add a 2400 or higher ATK “Sylvan” monster from your Deck to your hand, while the 2nd effect works with the effects of “Sylvans” that send it from the Deck to the GY. Also, by using “World Legacy Survivor” you can send many “Sylvan” monsters and “Rose Bell of Revelation” to the GY. You can return “World Legacy” cards from your hand to the Deck with “Sylvan Charity”, allowing you to usefully activate “World Legacy Survivor”. Target “Bujintei Susanowo” with the effect “Trackblack”, allowing you to attack multiple monsters your opponent controls and draw a ton of cards. By activating “Black Garden”, you can use “Scapegoat” and “Scapeghost” to Special Summon Tokens that can be used for multiple Link Summons, while also Special Summoning a multitude of “Rose Tokens” to increase the monsters you can attack with “Bujintei Susanowo”. Use the effects of cards like “Bujingi Crane”, “Honest”, and “Concertrating Current” to raise the ATK of “Bujintei Susanowo” to wipe your opponent’s LP out in an instance. A Deck that combines Machines with “Endymion” cards from “Structure Deck R: Lord of Magician”. You can aim to Link Summon “Qliphort Genius” using “Sky Striker” Link Monsters as material. “Sky Striker” Link Monsters, can be used as materials for multiple Link Summons, allowing you to assemble 5 or more different named monsters in the GY, letting you Special Summon “Orbital Hydralander”.